72 y.o. male who had a six month history of painless myelopathic symptoms including difficulty with fine motor movements of the hands and increasing difficulty with gait. He was found on MRI to have severe cervical myelopathy with signal changes in his spinal cord. 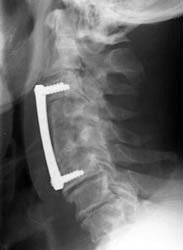 The majority of the compression took place at the C3-4 disk level as well as the C4 and C5 vertebral bodies. The patient underwent C4 and C5 anterior vertebrectomy, C3-4, 4-5, and 5-6 anterior discectomies and decompression, c3-6 anterior fusion with autogenous iliac crest bone graft (ICBG) strut graft with anterior plate fixation. 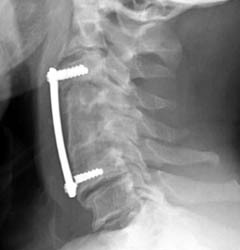 Lateral radiograph now 10 weeks post-operatively demonstrates interval fracturing of the two cortical screws in the vertebral body of C6. Superior displacement of the screws relative to the distal plate. Furthermore, the bone graft has tilted dorsally in its superior aspect as well.